Giuliani, speaking to several media outlets, also attacked Michael Cohen, the president's former personal attorney. For months, President Donald Trump has repeated the same refrain: There was "no collusion" between his campaign and Russia. But on Monday, his personal attorney, Rudy Giuliani, took a different tack, saying that "collusion is not a crime." "I have been sitting here trying to find collusion as a crime. Collusion is not a crime," Giuliani said in an interview on "Fox and Friends" Monday morning. “Everything that's been released so far finds the president absolutely innocent. He didn't do anything wrong,” Giuliani added. A little later, during an interview with CNN's "New Day," Giuliani made similar claims regarding collusion. "Colluding about Russians, I don't even know if that’s a crime, colluding with the Russians," Giuliani said. "Hacking is the crime," he added, referring to Russian hacking of Democratic organizations and the Hillary Clinton campaign. "The president didn't hack. He didn't pay for the hacking." There is no statute covering "colluding" with a foreign power, but it is illegal to conspire to violate laws against not only hacking, but foreign participation in elections. In an indictment earlier this month, special counsel Robert Mueller accused 12 Russian intelligence officers of conspiracy to hack computers and to defraud the United States, alleging that people “known and unknown to the grand jury” participated in that conspiracy. 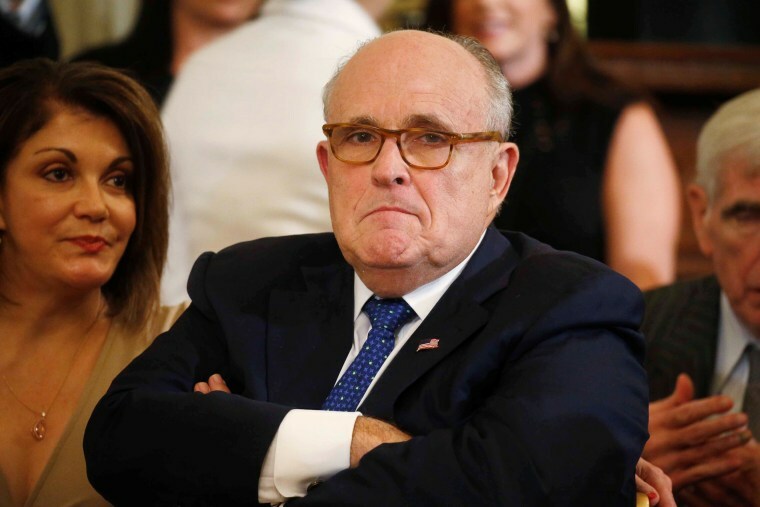 Giuliani's media blitz came a day after Trump tweeted once more that "there is no collusion" and reiterated his view that Mueller's investigation into Russian interference in the 2016 election is a "rigged witch hunt" and an "illegal scam." Giuliani on Monday also attacked Michael Cohen, Trump's former personal attorney, who asserted last week that Trump knew in advance about a meeting at Trump Tower in June 2016 between his son Donald Trump Jr. and a Russian lawyer. Then-Trump campaign chairman Paul Manafort and son-in-law Jared Kushner also participated in that meeting. A knowledgeable source told NBC News that Cohen is willing to inform Mueller that Trump Jr. told his father about the meeting, contradicting Trump Jr.'s congressional testimony in May 2017. Trump has also asserted he didn't know about the meeting. Giuliani, asked on CNN how he could be certain that the president didn't know about the meeting beforehand, said that "nobody can be sure of anything" before denying that Trump had known about it. Giuliani also accused Cohen, as well as Cohen's lawyer, Lanny Davis, of incorrectly describing the attendees of various meetings that involved top figures in the Trump campaign around that same time period. He also appeared to suggest that another meeting had occurred at some point before the Trump Tower meeting, in which participants purportedly discussed "strategy" for the meeting with the Russians. “This meeting that Cohen’s talking about took place before the meeting with the Russians, but the other thing that's contradicted is Cohen also now says, 'cause he says too much, that two days before he was participating in a meeting with roughly the same group of people but not the president, definitely not the president, in which they were talking about the strategy of the meeting with the Russians," Giuliani said on CNN. "The people in that meeting deny it." A source familiar with the secret testimony of key Trump Tower meeting participants to the House and Senate Intelligence Committees told NBC News that none of them ever raised the issue of a strategy session to get ready for the meeting. Neither was such a session mentioned in their testimony to the Senate judiciary committee, which has been made public. When asked for comment by NBC News about Giuliani's statements about a strategy session, Davis declined to comment. Manafort, whose fraud trial starts Tuesday, declined to comment through his spokesman. Representatives for Kushner have not responded to a request for comment. An attorney for Trump Jr., Alan Futerfas, said in a statement, "We have investigated this matter for over a year and are in command of the facts. We are fully confident of the accuracy and reliability of the information that has been provided by Donald Trump Jr. in the various investigations." In a second interview with Fox News later in the day, Giuliani sought to clarify his remarks about an alleged strategy meeting ahead of the June 2016 Trump Tower meeting. Giuliani suggested that in his earlier interview with CNN, he was speaking about information leaked by Cohen to a handful of reporters, which Giuliani had then gotten wind of. "That meeting never ever took place," he said. "It was a figment of his imagination or he is lying," he said, referring to Cohen. Meanwhile, in his interview Monday with CNN, Giuliani also suggested the Mueller should have to explain some of the president’s tweets. During a discussion about what Trump meant in another Sunday night tweet — in which the president wrote “is Mueller ever going to release his conflicts of interest with respect to President Trump, including the fact that we had a very nasty & contentious business relationship” — Giuliani refused to explain what his client may have meant and said Mueller should be the one to explain what the president was saying. But when asked what the conflict was, Giuliani said, "I can't tell you. I’m not sure I know exactly what the conflict is." NBC News has reached out to Mueller's office, which has so far not commented. Ken Dilanian and Hallie Jackson contributed.